Clarets chairman Mike Garlick insists there is no “For Sale” sign at Turf Moor amid speculation surrounding a potential takeover. While the club is open to outside investment, Garlick and the board of directors would want to keep their hands on the steering wheel to continue a remarkable journey. Burnley last week announced a £22.2m profit for the 2016/17 season, in which the club maintained Premier League status at the third attempt. And Sean Dyche is on track to guide the club to a top 10 top-flight finish for the first time since 1975 - and maybe even European football, 51 years since the club’s last continental campaign. It all adds up to make Burnley an enticing prospect for businessmen queuing up to get on the Premier League gravy train, with the club recently linked to investors from America and the Middle East - speculation which was quickly shot down. Come what may, Garlick, who has been chairman since 2015, after taking over as co-chair alongside John Banaszkiewicz three years earlier, would want to retain his say in the club’s future. Garlick said: “I’m planning to stay another five years. I can’t see any changes on the horizon – I don’t think any of the board members are going imminently challenge me. “I get calls quite regularly from people saying they’d be interested in investing. “We have an attitude of ‘If you want to, who are you? What do you want to do?’ When I ask questions like that most people tend to go away. “You’ve got to be careful what you wish for. These people are unknown quantities, you’d have to get to know them pretty well before you made a decision. “If someone wanted to come in and invest money and they are the right calibre then we’d always seriously look at it, but there’s not a for sale sign up that’s for sure. “If it did happen I’d want to stay and I think everyone else would want to stay in place. 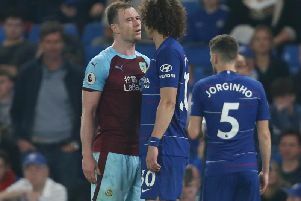 Burnley are something of an anomaly in the Premier League in that they are owned by long-time supporters, rather than overseas investors, and that is a plus point as far as Garlick is concerned: “It would be a shame to pull that apart. That mantra has been applied on and off the pitch as the club have steadily built under his stewardship, and that of Dyche. Burnley were promoted in 2014, and relegated a year later, coming back stronger after choosing to invest in the club’s infrastructure. That decision has borne fruit, and Garlick admitted: “Put quite simply it’s the best position we’ve ever been in, I think in the history of the club, not just recent times – financially speaking. “It was a slightly different balancing act between the season’s figures and, say, two years before when we were last in the Premier League. “We gave it a real go this time, we really did invest some money in making sure that we had stay up. “We’d done all the development work at Barnfield (training ground), the monies had gone up in the Premier League so we had more cash at our disposal, so we had to give it a go to try and stay up, which we did of course. “If we’d adopted more of a similar approach to last time around and maybe spent a bit less the profits would have been higher, but would we have still been in the division? Maybe not."